In this fast moving and technologically advancing society we live in it is becoming more and more common place for the use of credit and debit cards as opposed to cheques and cash. The idea of credit and debit cards is so that we – as consumers – do not have to carry large sums of money about our person when we go shopping. This reduces the chances of us being robbed, mugged or even losing the money we are in possession of. It also reduces the risk of old fashioned cheque fraud. The number of retailers now accepting cheques on the high street is dwindling and it is expected that within the next two to three years cheques will be obsolete altogether. For many of us credit cards have two distinct advantages – one they allow us to purchase goods and services both on the high street and on the Internet and two, they allow us to do so using credit facilities that we might not be able to draw upon otherwise. Credit cards are used as a means to make purchases which we may not have the money to make just at that time with the opportunity to pay the money back at the end of the month or over a designated period of time using regular payments set up as direct debits or standing orders. Using a credit card in a high street store is a simple process which now involves the use of so-called Chip and PIN. The Chip and PIN function – also used for debit cards – requires the keying in of a four digit number that activates the card and allows the transaction to take place providing sufficient funds are available. It is taken as read that the individual who is in possession of the credit card is the card’s owner as only he or she should have knowledge of the four digit PIN (Personal Identification Number). However shop owners and those working behind the counter are obliged to check the name on the card to insure that it is valid. I.E. : if the card name is female, is the individual using the card female? Using your debit card is much the same as using your credit card but with one fundamental difference - you can only make purchases if your bank or building society account has sufficient funds in it at the time of purchase. Basically a debit card is another way of paying for items using cash without having cash to hand. It is worth noting however that some high street retailers may take the details of your card and allow the purchase to go through but it can take several days for the transaction to show on your account. This is particularly so with building societies who operate their accounting systems in a slightly different manner to banks. If you are using your debit card for purchases online or on the high street and you have access to online banking you should check to see if the purchases have registered or – at the very least – that your available balance has changed. Most online retailers will accept either card except some American sites that accept most credit cards but will decline a debit card if it is not on their preferred list. If you are using your card online you should first ensure that the site you are going to use has a credible reputation and also a guarantee facility in place. This means that if there is an issue with the purchase that you can contact the company directly and request a refund. In addition it is recommended that you do not use your card on a computer that you are unsure of. 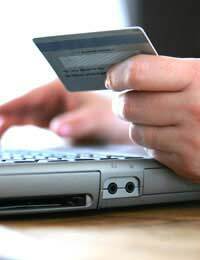 For example never use your credit or debit card to make a purchase on the computer of an Internet café as these are likely to be used by many individuals throughout the course of a day and details may be stored after you have gone. Whichever computer you use make sure that it has anti-virus and Spyware software installed to combat the chances of any outside intrusion which could result in the illegal collection of your details. Alternatively if you are using your credit or debit card in a high street store or indeed to withdraw cash from an ATM (Automatic Teller Machine) make sure that there is sufficient space between you and the person behind you. This reduces the risk of so-called ‘Shoulder Surfing’. You will find also that any counter staff in stores and shops are required to look away when you input your PIN (Personal Identification Number).